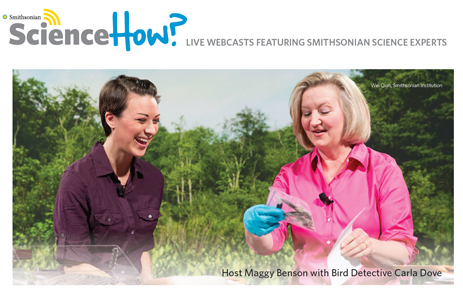 Bring real-world science and Smithsonian experts into your classroom with Smithsonian Science How? webcasts. Join live webcasts that feature Smithsonian experts who examine bones and artifacts that are millions-of-years old, piece together forensic anthropology mysteries, and dive into coral reefs. Your students will see how scientists and other experts use tools and technology in their work, and how the science is connected to them. For more information on bringing Smithsonian Science How to your neighborhood, contact your National Outreach Manager. With a name chosen to inspire curiosity and the excitement of discovery, Q?rius is a first-of-its-kind interactive and experimental learning space that brings the unique assets of the Smithsonian’s National Museum of Natural History – the science, researchers, and collections – out from behind the scenes. Visitors are invited to be an active and contributing part of this dynamic and engaging community. Q?rius (pronounced curious) was made with exploration in mind. Through conversations with scientists and interactions with thousands of authentic specimens and objects, visitors will enhance their grasp of the natural world, awaken new interests, and build inquiry skills for life. Educators visiting Q?rius will be invigorated with fresh ideas about how to engage their students in science. For more information, visit http://qrius.si.edu/.